Is it possible the last of the Reinhart brothers might be the first to go No. 1 at the NHL draft? The odds are pretty good, according to preliminary reports. Sam Reinhart, a center with the Kootenay Ice of the Western Hockey League is part of a new group of prospects from around the globe hoping to make an impact prior to the 2014 NHL Draft, which will be held June 27-28 at Wells Fargo Center in Philadelphia. As expected, the 6-foot-1, 186-pound right-shot forward has earned a spot on NHL Central Scouting's 2013-14 Futures List, which is comprised of players the League's scouting arm considers to possess first-, second- or third-round potential. Reinhart, who considers his hockey sense his best attribute, led the Ice last season in goals (35), assists (50) and points (85). "He has a complete game at both ends of the ice," Central Scouting's Peter Sullivan told NHL.com. "He does everything well. He won't get you overly excited, but from a coaching perspective, he's the guy you always want on the ice in critical situations. He's your go-to guy and team leader and is just going to be consistent at the junior level, and eventually the pro level." Reinhart not only was captain of Canada's team that won the gold medal at the 2012 Ivan Hlinka Memorial Tournament last summer, but he also wore the "C" for Canada's entry at the 2013 IIHF World Under-18 championship that won gold. At the U-18s in Sochi, Russia, in April, Reinhart had three goals, seven points and a plus-7 rating playing primarily on a line with Morgan Klimchuk (Calgary Flames, first round, 2013) and 2015 draft-eligible Connor McDavid. Reinhart has a strong hockey pedigree. 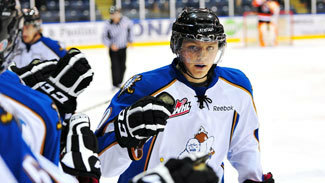 Max Reinhart, 21, was taken by the Calgary Flames in the third round (No. 63) of the 2010 draft. The only defenseman in the trio of brothers, Griffin Reinhart, 19, was chosen No. 4 by the New York Islanders in 2012. The boys' father, Paul Reinhart, was taken by the Atlanta Flames with the 12th pick of the 1979 draft. "All three brothers are different, but the youngest could turn out to be the best of the bunch," Sullivan said. A few other potential first-round candidates from the WHL, according to NHL Director of Central Scouting Dan Marr, are Prince Albert Raiders center Leon Draisaitl, Portland Winterhawks center Chase DeLeo, Red Deer Rebels defenseman Hayden Fleury, and Calgary Hitmen left wing Jake Virtanen. Winterhawks center Dominic Turgeon, the son of former NHL forward Pierre Turgeon, also is sure to be on every scout's radar entering the 2013-14 season. Central Scouting's Chris Edwards is very high on three players from the Kingston Frontenacs in the Ontario Hockey League: left wing Samuel Bennett, right wing Spencer Watson and defenseman Roland McKeown. "Kingston could be next year's Halifax," Edwards told NHL.com. "As the 2012-13 season went on, Roland showed the ability to jump up into the rush and contribute a little. I don't know what type of guy he'll be, but it'll be interesting to see how he grows this season. He played every game at Kingston and has good size (6-foot-0.5, 186 pounds)." McKeown had seven goals and 29 points in 61 games for Kingston in 2012-13. Watson had 23 goals and 43 points in 63 games, and Bennett had 18 goals and 40 points in 60 games. "[Watson and Bennett] made the Frontenacs go [in 2012-13]," Edwards said. "They struggled at times and hit a wall for quite a while, but that's understandable. They were in a tight playoff race, and most nights generated most of the offense. Watson has an excellent shot and gets it off quickly. Bennett is more of a playmaking kind of guy." Another player from the OHL to keep an eye on is defenseman Aaron Ekblad, who was awarded exceptional player status two years ago, meaning he was deemed eligible for the OHL draft as a 15-year-old, a year younger than the standard of age 16. Ekblad (6-3.25, 213) had 10 goals and 29 points in 63 games as a rookie in 2011-12 and had seven goals, 34 points and a plus-29 rating in 54 games in 2012-13 while dealing with lower-body injuries. "Aaron was used on the top defensive pair as well as both the power-play and penalty-killing units," Edwards said. "He's fit in very well and shown he deserves to be in the league as an underage player." Ekblad was named captain of Team Ontario at the 2013 World Under-17 Hockey Challenge and finished as the second-highest scoring defenseman at the tournament with six points (two goals, four assists). "He has a hard, accurate shot and shows a lot of poise and confidence," Edwards said. "He is physically strong and uses his size and strength very well. He will not back down when challenged and moves the puck well with hard, accurate passes." Among the top draft-eligible players in the Quebec Major Junior Hockey League is Sherbrooke Phoenix left wing Daniel Audette. The first pick of the 2012 QMJHL draft is the son of Donald Audette, who played 14 seasons in the NHL with six teams. In the United States Hockey League, the player to watch might be 5-foot-11, 158-pound center Nick Schmaltz of the Green Bay Gamblers. A creative center with an edge to his game, the University of North Dakota recruit is the younger brother of Jordan Schmaltz, who was chosen in the first round (No. 25) by the St. Louis Blues in the 2012 draft. Nick had 18 goals, 52 points and 18 power-play points in 64 games with the Gamblers in 2012-13. Another player to watch is center Ryan MacInnis, the son of Hall of Fame defenseman Al MacInnis. Ryan starred for the United States National Team Development Program under-17 team in 2012-13 and likely will see more time with the under-18 team in 2013-14. 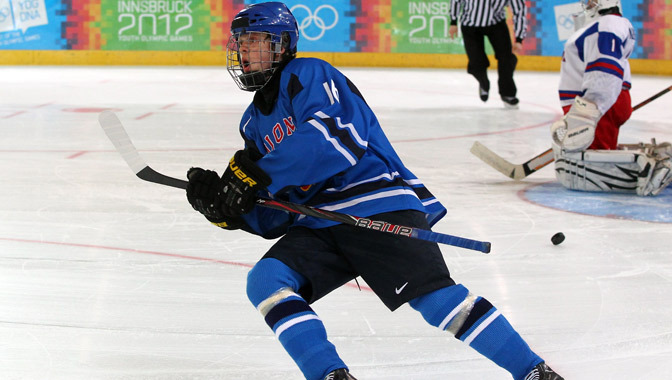 MacInnis had 15 goals and 25 assists in 52 games for the U-17 team in 2012-13. One of the top-ranked goalies of the 2014 draft class also plays for the USNTDP U-18 team: Boston College-bound Thatcher Demko. A native of San Diego, Demko went 30-9-4 with six shutouts, a 2.08 goals-against average and .910 save percentage in 46 games with the U-18 team in 2012-13.